Nashville duo Hammock - Marc Byrd and Andrew Thompson - have carved a niche for themselves on the post-rock scene with releases that have successfully stirred the listener's emotions into a state of sublime escape. Theirs is music of limited form but widescreen scope, fluctuations in their layered landscapes as subtle as the slightest ripple on the largest lake. But their transcendental qualities are beyond reproach, previous collections tailored to accompany the finest vistas: the grandest skies over the iciest glaciers, lofty mountains bordering epic salt plains. That, though, was then - their last release being 2008's Maybe They Will Sing For Us Tomorrow, a near-live recording (minimal overdubs were added) which accompanied the stateside premiere of Jonsi Birgisson and Alex Somers' ambient music/visual art project Riceboy Sleeps. That was (is) a beautiful record, one that reveals its delicate charms over several listens before attaching itself to the top of one's most-played favourites. It remains a long-journey sink-into staple in these ears, as elegant as anything sculpted from sonic silver and gold by the similarly styled likes of fellow Texan duo Stars of the Lid and Japanese minimalist Chihei Hatakeyama. 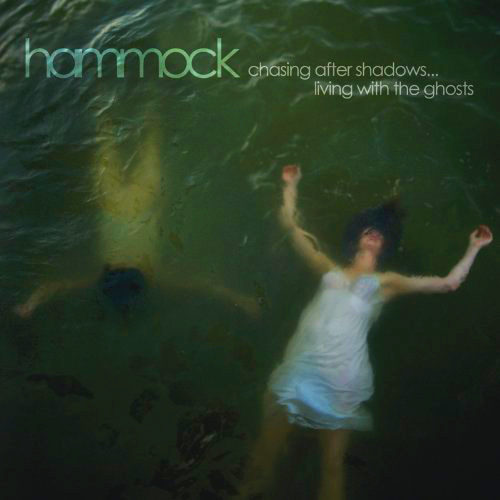 Chasing After Shadows… Living With the Ghosts, by comparison to its immediate predecessor, feels uncomfortably boxed in, its textures equally rich but unable to flow in the manner its makers previously permitted. It's a less freeform approach to ambient music, closer in studied design to Hammock's second studio effort proper, 2006's Raising Your Voice… Trying to Stop an Echo. It's not without beauty, but the bliss experienced here is of a more orthodox shoegaze sensation. Where they only recently aimed their sights at the stars, it seems as if Byrd and Thompson have returned to earth with a back-to-reality bump. But this is criticism with an obvious flaw - Maybe They Will Sing… was an album of overcoming restrictions, played live by musicians whose natural environment was the studio. Chasing After Shadows… is therefore a reminder of regular form, and it must be stressed that even though it might come up slightly short subjectively, from a purely objective standpoint this ranks as one of the most beautiful albums of this year. The shapeless vocals of Breathturn are immediately arresting, the slow-shifting shimmer of The Whole Catastrophe superbly sanguine of feel, and You Lost the Starlight in Your Eyes builds to a fists-aloft roar before coasting to a lump-in-throat climax of contemplative calmness. Those who prefer Hammock when they're operating outside of their comfort zone will easily pinpoint shortcomings here (not least of all some patchy production - there are distracting pops and clicks that should have been addressed). But newcomers, those moved by any of the aforementioned acts as well as the more bombastic Mogwai and Godspeed, are encouraged to investigate a band that effortlessly transports the listener to extraordinary mind's-eye horizons.